Among spiders, some species could be qualified as colonial. Individuals may live alone or in colonies where each spider exploits its own capture web in a communal network. We compared solitary with colonial life in Cyrtophora female populations from South-East Sicily in 1992 and 1993. 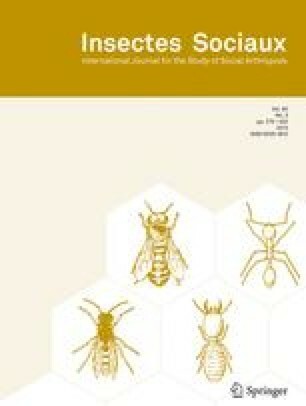 We used 6 parameters to describe and compare the populations: spider size, web size, egg production, prey captured, presence of kleptoparasites and their size.¶ Spiders living in colonies did not differ in size from solitary spiders.¶ The webs of colonial spiders were smaller than those of solitary spiders.¶ The number of prey captured and their size did not differ between the two types of spiders.¶ Solitary spiders produced more eggs than colonial individuals.¶ Kleptoparasite spiders Argyrodes gibbosus were more numerous in the webs of solitary spiders than in the webs of colonial spiders and there were more solitary webs infested by kleptoparasites in 1992. The kleptoparasites were larger in colonial webs than in solitary ones. Another species of spider, Holocnemus pulchei, spun its own web in the network of the web of Cyrtophora. The number of Holocnemus per web did not differ between solitary and colonial Cyrtophora.¶ Results are discussed by referring to what it is known in other temporarily social spiders. Key words: Life history, kleptoparasitism, interspecific relationships, sociality, spiders. Received 5 December 1996; revised 9 May and 25 October 1997; accepted 5 November 1997.